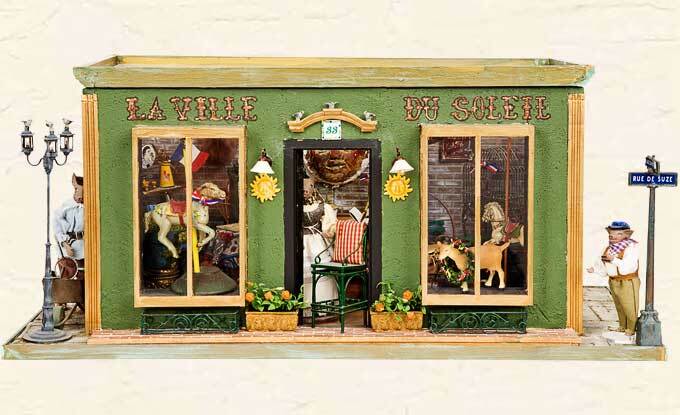 24.5" x 12.1" x 11"
La Ville du Soleil was a real store on Sansome St. in San Francisco, CA. It was started by Suze's mentor Lillian Williams and her husband Teddy in the late 60s, early 70′s. Lillian was a pioneer in importing French antique furniture to the United States. She haunted the Paris flea markets for bistro ware, café tables, baskets, armoires, buffets, brass chandeliers, animal heads, street signs and much more more. Going into her shops was like a kid going into a candy store--you wanted all of it. The stores are no longer in existence but her legacy lives on in the San Francisco Bay Area. Lillian always used dressed animals in her scenes, as Suze does now. So here at La Ville Du Soleil you see Lillian waiting at the door for Teddy who is hauling a piece of furniture in a vintage wheel barrow.